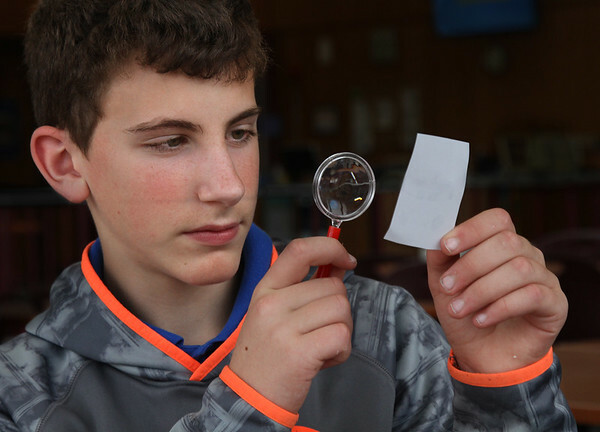 Eighth-grader Peter Scola uses a magnifying glass to study a fingerprint during a meeting Wednesday of the after-school "Master Detectives" club at O'Maley Innovation Middle School in Gloucester. The club, which meets once a week, is led by guidance counselor Paula Gray, a fan of the Sherlock Holmes mystery series. Each week the students are given a different scenario and an assortment of clues, such as fingerprints, footprints, handwriting and various substances that can be analyzed chemically. When the mystery is solved, the students get to watch a different Sherlock Holmes movie every week.